For most of us, switching to a vegetarian diet might be a matter of a New Year's resolution and a fair amount of willpower, but for an entire species, it's a much more involved process -- one that evolutionary biologists have struggled to understand for a long time. Researchers at the University of Arizona have taken a peek behind the curtain of evolution to find out what happens when an insect species dramatically changes its way of life. The processes they discovered involve never-seen-before remodeling of genes, behaviors and diet. The results, published in the Proceedings of the National Academy of Science, or PNAS, are likely to make you ponder evolutionary questions next time you find a fruit fly floating in your glass of wine. Herbivorous insect species make up half of all known insect species, but the switch from a non-plant diet to herbivory evolved in only one-third of living insect orders. That discrepancy has puzzled biologists for a long time. "It implies that the transition to herbivory happened rarely, but when it happened, it turned out to be a major push for speciation spawning the evolution of a disproportionate number of species in that group," said Benjamin Goldman-Huertas, a fifth-year doctoral candidate and National Science Foundation graduate research fellow in the UA's Department of Ecology and Evolutionary Biology, and the lead author of the paper. One of the possible answers is that plants are very difficult to colonize, said Noah Whiteman, an assistant professor of ecology and evolutionary biology and senior author of the study. To ward off their predators, plants have evolved an arsenal of defenses, such as spines, tough outer "skin" or compounds that render their tissues indigestible, unpalatable or even fatally toxic to insects attempting to feed on them. "Most plant-eating insects are parasites," Whiteman explained. "They're not like elephants roaming the savannah and ripping off leaves here and there. Insects have evolved ways to overcome those defenses but at the cost of becoming highly specialized. Many herbivorous insect species are extremely specialized, to the point where the animals have to spend their entire life cycle on their host plants. "Switching from feeding on microbes, decaying meat or other insects to targeting plants requires ways to attract the insects to the plants, lay their eggs there and keep their larvae alive on the plant. We wanted to test the hypothesis that this transition required drastic changes in behavior, which in turn required remodeling of the genetic and neurological processes underlying those behaviors." To find answers, the authors studied the fly species Scaptomyza flava, a close relative of the fruit fly Drosophila melanogaster. Unlike their cousins, which often are seen hovering around the produce aisle, feasting on fruit that's past its prime, Scaptomyza flies don't wait that long. The females seek out healthy plants in the mustard family, pierce tiny holes into their leaves, drink the plant juice seeping into the wounds and deposit their eggs in the leaves. Upon hatching, the larvae munch their way through the leaves, making tiny tunnels as they go, and sometimes even kill the plant. To study the flies' responses in more detail, Goldman-Huertas collaborated with researchers in the group of John Hildebrand, a Regents' Professor in the UA's Department of Neuroscience, which allowed them to measure the electrical responses in the insects' antennae generated by olfactory receptors when presenting the animals with various scents. "It's like recording from the population of receptor cells in your nose," Hildebrand said. "We look for electrical signals indicating that the antennal receptor cells have recognized and responded to a certain scent stimulus. If we don't see a signal, it means that the antenna doesn't respond to that compound." Such neurological assays, combined with behavioral observations, revealed that the smell of yeast, which thrives on rotting fruit and acts a huge attractant to Drosophila, left Scaptomyza flies cold. Conversely, "we found that Scaptomyza flava is very sensitive to the compound that is responsible for the scent of freshly cut grass, which is common in leafy plants," Whiteman said. Goldman-Huertas hypothesized that the olfactory genes that are involved in sniffing out yeast should be lost in Scaptomyza, and indeed, "we could not find many of them in any of the populations we tested," he said. According to Whiteman, the flies' preference for compounds associated with yeast and alcoholic fermentation is considered a more ancestral state than Scaptomyza's preference for fresh plants. "The fruit fly species floating in your wine glass really represent 100 million years of evolution because the sensory mechanisms are conserved in species that are attracted to wine," he said. 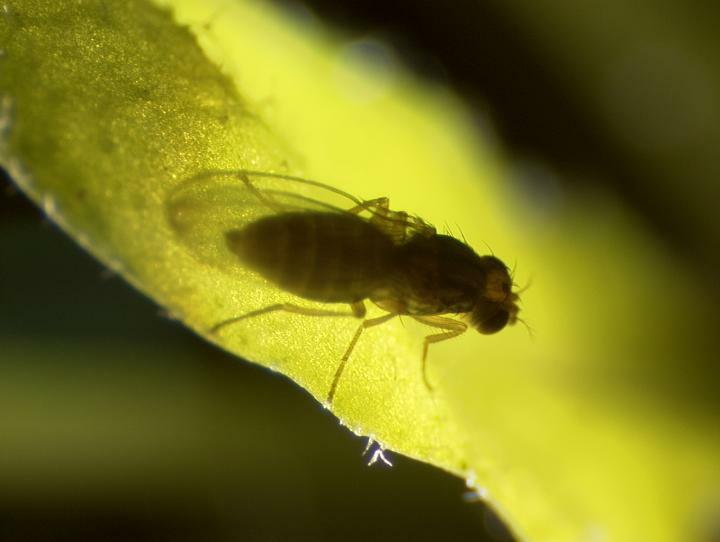 To study the genetic basis of the flies' food preferences, the researchers took advantage of Scaptomyza's close kinship with D. melanogaster, whose olfactory system is the most extensively studied of any animal. "Scaptomyza is a very useful model to study genetic underpinnings because on the one hand, it is closely related to D. melanogaster, but on the other hand, it is evolutionary diverged," Whiteman said. "In these flies, herbivory evolved in the last 20 million years at most. The changes are recent enough that we are able to detect them and compare them to non-herbivorous sister species like D. melanogaster. "But loss of behaviors doesn't make you go on to new feeding grounds, so some gain of function must have happened as well." Indeed, the team discovered a group of olfactory receptor genes that have undergone a disproportionately amount of sequence change. "This suggests Darwinian evolution has changed the function of these genes," Whiteman said. "Understanding how these ecological changes can come about can have huge economic and health implications," Goldman-Huertas said. "Scaptomyza flava is an emerging pest of canola in Europe and of mustard plants in New Zealand. "Or take the Anopheles mosquitoes that spread malaria. How did they start feeding on humans? Or the Colorado potato beetle that originally fed on other related plants. How did that switch come about? How insects make decisions impacts the lives, health and wellbeing of people."